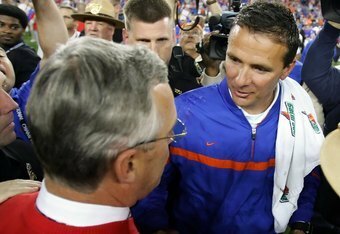 Ohio State enjoyed a pretty successful decade-long run under then-head coach Jim Tressel. Despite NCAA sanctions, many have claimed that the Ohio State program came out looking better than it did before, with now-head coach Urban Meyer. With every new season comes new expectations, especially true when a head coach with two national championships comes to town. In order to gain some perspective from outside the Ohio State media community on what the program should expect under Urban Meyer and his new coaching staff, both for 2012 and beyond, I stepped outside the Buckeye bubble, if you will. A great group of guests from around the country, and with various media outlets, joined me to answer questions on the Ohio State Buckeyes. What are your expectations for Ohio State this season? What would you consider a success or failure for Urban Meyer's first year at OSU? Bruce Feldman: I'd consider nine wins or more a successful season or eight plus a win over Michigan – given how shaky 2011 was and the sanctions taking away post season hopes. I'd say anything less than eight wins and/or a blowout loss to Michigan would be a disappointing debut season. It's Urban Meyer, and fair or not, the expectations are high. That's what happens when you have made the impact he has in his three coaching stops. Andy Staples: I expect them to win two or three more games than last season. They have a good defense – Ryan Shazier should be All-World – and the offense can't be any worse than it was last season. Braxton Miller fits Meyer's offense well, but they'll need some playmakers to emerge. I imagine Meyer probably dusted off a lot of the old Aaron Hernandez plays when he met Jake Stoneburner, but Meyer's offense also needs a significant contribution from the more traditional wide receiver group to really hum. I'm not sure a coach can fail in his first season, though I imagine some Maryland fans disagree with me at the moment. I'd call any record better than the 2011 regular season a success. Spencer Hall: I think anything but improvement in the wins column would represent failure, since last year was moving dry rot in all directions. With even a semblance of an offense, this is an eight win team, and more if the Buckeyes get the ebullient confidence of a team with nothing to lose. Thanks to the probation/bowl ban/shunning they're currently under, this is entirely probable. Ineligible teams are the very attractive married woman alone at the bar: not taking anything home, but still simultaneously ruining someone's hopes that night. A lot of the conversation has been around Urban Meyer elevating Ohio State to the SEC's level. Without a marquee OOC game (sorry Cal) or the possibility of the postseason to use as a benchmark, what can we look for on the field to determine whether or not the Buckeyes are closing in on that goal? Realistically, how long could it take? Chris Huston: I don't think OSU needs to be elevated to any league's level. Ohio State is already a marquee program that just needs to have a good coach in place who can recruit Ohio well and then use that talent properly. When you instill an overall philosophy like Urban Meyer's and combine it with the talent level on Ohio State's roster, you tend to get great results. Look what happened at Florida. The Gators always had the talent, but they weren't using it well under Ron Zook. Meyer comes in and suddenly they dominate. It wasn't that the talent suddenly got better, it was that Meyer took the existing talent and made it better and then used that success to bring in more talent. He'll do the same at Ohio State. As with Florida, it will take a year or two for things to gel, especially on offense. The thing to look for this year is the development of the offense. When you start to see Braxton Miller running around like he knows what he's doing, then you can start to get excited. Ohio State has—and has always had—the athletes to compete with any school in the country. You are about to see what happens when those athletes are unleashed. Spencer Hall: The best indicator will be at the two positions most differentiated in the SEC: defensive back and along the defensive line. That will take a few years, but for all the talk around the "Percy Harvin position" in the Meyer offense, his Florida teams thrived off the edge on the line and on the edge at corner. That will take a year or two to shake out, and depends a lot on how recruiting patterns hold. Ohio State, more than any other team, should be painfully familiar with just how much better these two positions can make an already good team, especially in a one-game scenario. Bruce Feldman: Short of Michigan upsetting Bama and then OSU winning double digits this fall and finishing it off by thumping the Wolverines, that is going to have to wait at least till 2013. And realistically, even if those things happen, it's still just one step on an uphill climb. The SEC dominance didn't just happen overnight and it's going to take more than a big win or two to undo that perception because when you win six BCS titles in a row you're gonna get a lot of benefit of the doubt. 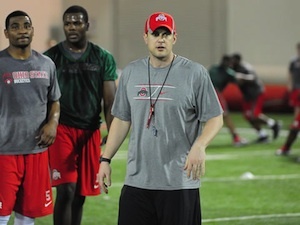 Tom Herman and Braxton Miller prepare for the 2012 season. What do you think new Offensive Coordinator Tom Herman adds to this program, beyond what we've already seen Urban bring to Florida and Utah? Are you expecting growing pains to be a concern for the Buckeyes, as they adapt to a new offense? Lisa Horne: We all remember how Michigan had a lot of growing pains adjusting to then-coach Rich Rod's spread offense. A successful coach will scheme around his players' greatest assets, not force them to adjust to a style of play that their bodies weren't built for. Try as you may, you can't fit square pegs in round holes. I think a lot of Herman's success depends on how agile and athletic his offensive linemen are as well as his flexibility in tweaking the system to accommodate the current roster. Bruce Feldman: Herman's very sharp. He's proven to be a good gameplanner and teacher, and what Urban likes to do and what Tom has done over the years has a lot of overlap. Tom told me how much he's already learned from Urban Meyer in terms of how to run a program, motivate players and build a team. The biggest missing piece right now are dynamic WR and TB types. That's going to hurt not having that component but they're going to be versatile and keep people off balance. As talented as Braxton Miller is I don't expect growing pains because of his inexperience. Chris Huston: First, Herman is an obvious upgrade over the previous OC. Second, I think Herman helps Meyer update his approach a bit and will hopefully be a check upon any desire on Meyer's part to 'reinvent' what he did at Florida. To wit, Meyer's insistence on having a player fill a 'Percy Harvin' role might be counterproductive if there is no obvious player who fits that bill. Sometimes you just have to go with what you have and adjust accordingly. I think there will be some growing pains with the offense, but not as much as at Florida for Meyer, where there was a quarterback (Chris Leak) ill-suited for the offense. Here, Meyer has a prototype in Miller at his disposal. I think most of the issues will be at receiver and wouldn't be shocked if Miller was a bit mistake-prone in the early going. I expect them to be pretty good about 2/3 of the way in, though. The postseason ban affects the program in multiple ways, particularly with momentum going into the following year, which could be pivotal for Urban Meyer. What do the Buckeyes need to do in 2012 in order to stay on track for a big 2nd year by Meyer in 2013? Robert Flores: Urban Meyer infuses enthusiasm and "juice" (one of his favorite words) into a program that has one of the most passionate fan bases in the country. I think the Buckeyes will be better than last season under Meyer and will start an upward trend that will once again have them among the elite in college football. I do think that because of the bowl ban, the final game of the year against Michigan becomes even more important for Ohio State, if that's possible. Catch up on everything you need to know ahead of the season kickoff. Lisa Horne: One intangible that can come into play this season is players lacking motivation to play 100 percent. I spoke with several players at USC after the first year of their post-season ban and they candidly admitted they didn't give it their all because they were playing for nothing. It's understandable, especially in elite programs where many starters dream of playing professionally. Why risk a career-ending injury? Can a coach turn that mentality around? Yes, but one big loss or injury could also douse his fire and brimstone speeches. Head coach Urban Meyer's best weapon is three-fold: First, play both starters and reserves in every game. This will keep the starters on their toes and remind them that their position is up for grabs if they don't compete in every practice and every game. Second, reinforce the spoiler role and how they could keep a rival like Michigan out of a BCS Championship. Finally, their players are still eligible to win some major college football awards (e.g. the Heisman or Bronko Nagurski) which increases both their exposure to NFL scouts and potential salaries in contracts. For most of the seniors, this will be the last year they ever play organized football and Meyer needs to remind them of that. Michigan is now their bowl game. Andy Staples: They need to spend time at practice developing young players. That is quite difficult to do during the season, which is why most coaches save it for bowl practice. Since Ohio State won't have those 15 extra practices, coaches may need to give some quality reps in regular-season practices to guys who might not contribute much in 2012 but will have to in 2013. Meyer has made multiple stops in his career, but supposedly we'll be seeing a new Urban Meyer at Ohio State, as mentioned in his introductory press conference and expanded upon in Wright Thompson's article. What are your thoughts on how much a newfound appreciation for work-life balance might affect the on-field product that Urban Meyer provides? Do you expect any drop off in success for Meyer now, since he's being pressured to not live and breathe football? Spencer Hall: I think he's the same dude, something I think Wright hinted at in the finish of that article. He's in a meeting, the anger rises, and you see him in this moment of utter conflict between his drive and the need for balance. I don't think he can do it, just because as a rule I do not believe people change for any reason--particularly when he had such success being a relentless burnout case. In six years he will be doing something else, but until he flames out again Ohio State has one of the best football coaches alive working in a league ripe for a pillaging to rival the wettest dreams of the most desperate Vikings. The trick is both parties knowing when to hit the eject button. Andy Staples: When I saw Meyer at Big Ten Media Days, he looked much healthier than the guy who resigned in Gainesville in December 2010. Does that mean he can maintain the balance that has allowed him to get healthy? Time will tell. He hasn't lost a game in almost two years. The losses were what really tore him up in the past and sent him into those dangerous, obsessive spirals. How he deals with those losses will determine how long he continues to coach. As someone outside of Ohio State, looking in, who and what are you most looking forward to seeing from the 2012 Buckeyes? Robert Flores: I'm looking forward to seeing Urban Meyer. He had so much success at Florida, but clearly paid a price. He says he's changed, and I'm eager to see how he handles this new challenge. Lisa Horne: I'm excited to watch quarterback Braxton Miller thrive under Meyer's offense. Last year Miller ran for 715 yards and seven touchdowns while passing for 1,159 yards and 13 touchdowns. He's a legit dual threat and he's just a sophomore. It's been a while since Ohio State has had an electric quarterback — yes Terrelle Pryor was electric but at times it was for all the wrong reasons — and the fans could be treated to some spectacular plays in the 'Shoe. I'm looking toward to watching an offense that for so long was labeled as "three yards and a cloud of dust" by both critics and self-deprecating fans but is now not only on the cusp of becoming a speedy threat in the Big Ten, but to the SEC as well. QB Braxton Miller has made some lists as a dark horse Heisman candidate. What are your thoughts on that? What needs to happen in order for him to land a spot in NYC in December? Do you think the postseason ban could affect him in the voting, as it arguably hurt Matt Barkley last year? Robert Flores: I don't see Braxton Miller as a viable Heisman contender, dark horse or otherwise. He's a freak athletically, but I think he will need time to grow in Urban Meyer's system. I do think the possibilities are endless for him in this system. Chris Huston: For Miller to be a Heisman finalist and get to NYC, he'll have to continue the impressive trend of the final games of his freshman season. If he produces for the full season what he did in his last two games as a freshman, he'll have around 2,400 passing yards, 24 touchdown passes, with about 720 rushing yards and 12 rushing TDs. Those are pretty good numbers, but he'll probably have to juice them a little further (like 1,000 yards rushing) to have a shot. If those numbers happen concurrently with a 10-win season that includes wins over Wisconsin and Michigan, he'll be seen as the spectacular young quarterback who kept OSU relevant during probation. And, so, he could be rewarded accordingly by Heisman voters. Unfortunately, not having that ability to play in a Big Ten Championship game will hurt, so he'd have to put up those incredible numbers in 12 games. But, he plays for Ohio State and when you are a great offensive player for Ohio State, you are always in the Heisman conversation.